My Easter basket Drew surprised me with. Did I mention that's candy grass in there? It’s been a very relaxing weekend in the Hawkins household. Yesterday morning we went for a run through Piedmont Park. I’m determined to become an outside runner and give up my vice for the treadmill, but it’s not easy. Maybe making a pact with myself to sign up for a 10K by the end of the year will help? If I could have Drew’s nutella-stuffed french toast after every outside run, I’m sure I would go almost daily 🙂 After a few errands and a late afternoon nap, we headed to Farm Burger in Decatur. 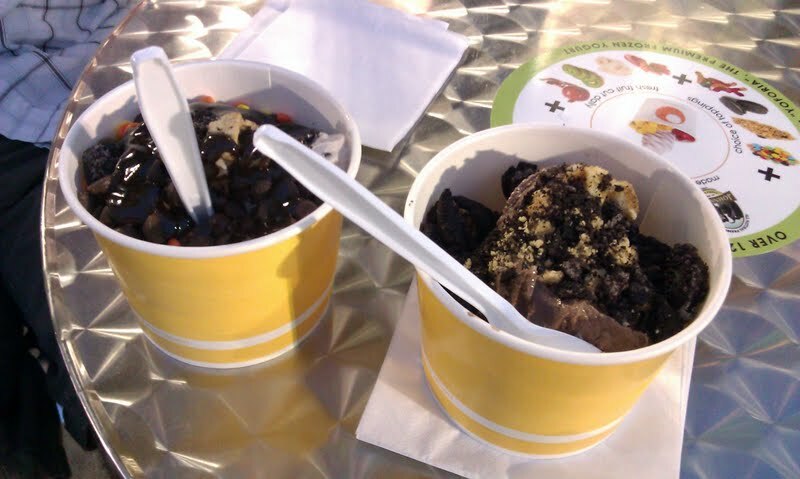 Both craving something sweet, we wrapped up the night with a trip to Yoforia. Frozen yogurt is not one of Drew’s favorites, so I was more than happy to polish off the remainder of his cup. Frozen yogurt from Yoforia. Chocolate mania! It was nice to sleep in this morning, although it felt strange not going to an early church service. We enjoyed sleeping in a few extra hours then made chocolate chip pancakes and an egg frittata for brunch. 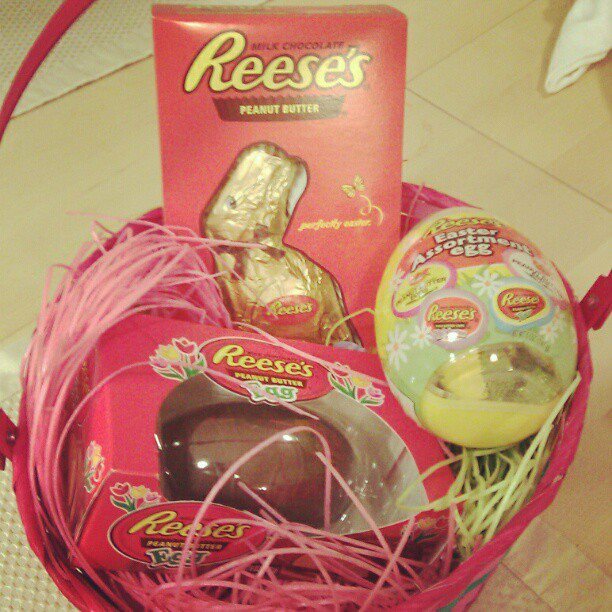 Drew surprised me with my very own Easter basket, complete with an abundance of Reese’s. What can I say? The man knows me well. Right now we’re spending the afternoon at Starbucks, sipping on coffee and working. 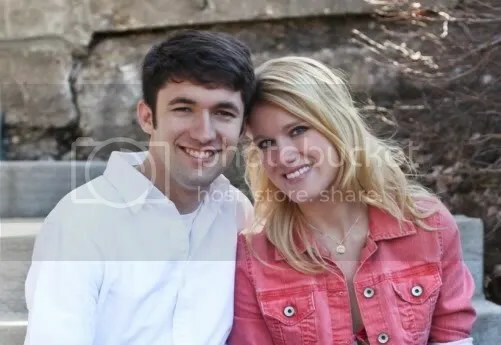 Rather, Drew’s working and I’m playing around on Facebook and Pinterest. We’re attending the 7 pm service tonight at Grace’s new building. One of our friends from our house church is getting baptized. What a perfect day to be born again! 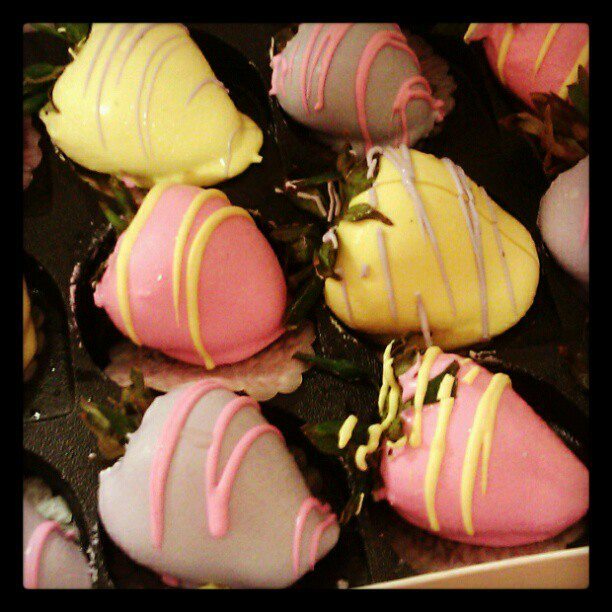 Chocolate covered strawberries Mom and Dad mailed to us 🙂 They are (almost) too pretty to eat! ← The Color Run…my first official 5K! I love outside running & HATE treadmill… maybe we could teach eachother a thing or two 🙂 Hope you had a Happy Easter! I love outside running & HATE treadmill! Maybe we could teach eachother a thing or two 😉 Hope you all had a Happy Easter!